Slate Crushing process is the major stage to handle with slate stone. SBM Machinery has deign the slate crushing plant to crush the hard slate stone. While slate stone is a kind hard, abrasive metamorphic rock. 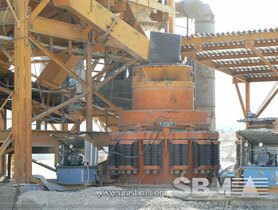 SBM Machinery will supply jaw crusher, cone crusher for the slate crushing. Complete set of stationary, portable, mobile crushing plant for slate is also available for the clients. In the slate crushing plant, the mined scrap slate rock is fed into rough crusher (i.e. heavy duty jaw crusher) for primary crushing, then the crushed stone is transported into fine crusher (i.e. cone crusher, impact crusher ) for secondary crushing or tertiary crushing. According to the clients' demands, SBM Machinery also can equip with VSI crusher for crushed stone shaping to produce high grade aggregate products. As a slate stone crusher machine manufacturer in china, SBM can offer types of rock crushing machines for crushing slate into suitable particle size. SBM can offer jaw, cone, impact and mobile crusher used as mining slate crushing machine. "Traditionally, slate crushing plant includes vibrating feeder, jaw crusher, cone crusher, belt conveyor, control system and so on. "